Gene Shannon’s first building project was a tree fort in his family’s backyard. Fascinated by the process, he soon built a small house a few feet away. But eight year olds are a little young to become contractors. At the age of 21, Gene left the Coast Guard and obtained his contractor’s license. Aside from a few years operating a tool importing company, he’s been a contractor ever since. Gene Shannon Construction has been successfully building and remodeling homes in Oregon for more than 40 years now. These days Michele spends most of her time managing the company’s office, handling communications, and keeping jobs running efficiently. Gene admits to a slight concession to age, subbing out the company’s roofing work. “Neither of us bounce too well if we fall,” he points out with a smile. In 1997 Gene and Michele decided to follow their hearts and moved to Lincoln City. “We knew that we were taking a big risk businesswise,” explains Gene. “Obviously, it’s a much smaller market than the Portland area.” But the couple kept reminding themselves of the benefit – “we get to live in paradise.” They purchased and cleared an empty lot a few blocks from the beach, lived in a trailer on the site, and built a chalet style home for themselves. 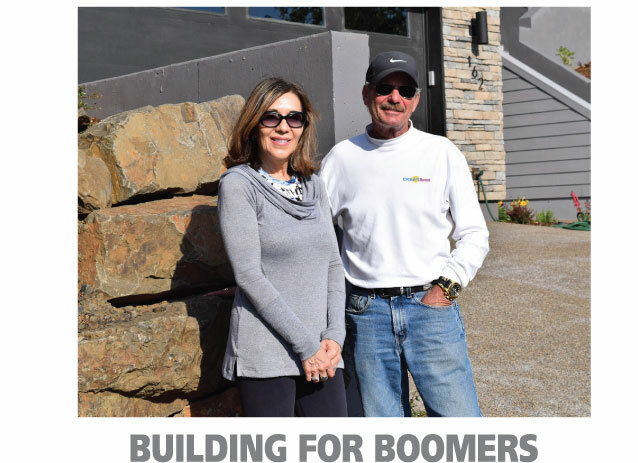 Over the years, Gene Shannon Construction has built 15 homes at the coast, but the company’s primary businesses are remodeling, home repair and restoration. “Dry rot repairs are one of our specialties,” says Gene. “Coastal weather is hard on homes.” In addition the company does siding repair, power washing, painting, home maintenance, weatherization, additions, decks, fencing, sheet rock repair, kitchen and bath remodels, hardwood floors, tile work, window & door repair, as well as dozens of other projects. Over the past several years, the 2-person company has found a niche servicing more than 50 owners of local vacation rentals. “We do everything from 24-hour repairs to handing out keys to renters,” explains Michele. Not only do we appreciate Gene and Michele’s loyalty, we also admire their work and ability to adapt to a cyclical economy. To succeed for over 40 years in the construction industry is certainly an accomplishment.